Word Herd is a mic minigame in Mario Party 6. 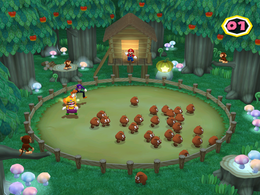 The player with the Mic has to guide a herd of Goombas away from the three other players, who try to punch them out of the corral. 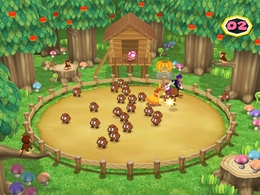 The player with the Mic can say "Up", "Down", "Left" and "Right" to guide the herd away from the other players, he/she can also say "Scramble" to disperse the herd. If there's at least one Goomba left, the solo player will win. However, if all the Goombas are gone, the three other players will win. "Left" – Move the Goomba herd to the left. "Right" – Move the Goomba herd to the right. "Up" – Move the Goomba herd upward. "Down" – Move the Goomba herd downward. "Scramble" – Disperse the Goomba herd. "Ukiki" – Makes one of the Ukikis throw fruits at the players, stunning them. After this happens, they go away. Once all three are gone, "Ukiki" cannot be used anymore. Rules – "One player shouts orders to herd the Goombas away from the other players, who will try to punch them out of the corral." Advice 1 – "The solo player should give the Goombas orders to keep them away from the fence!" Advice 2 – "Goombas won't listen to orders while they're moving. Wait until they stop before giving them another command." This page was last edited on January 16, 2018, at 14:27.